Julie SPEAKS TO TRANSFORM, she’s the first choice for meeting and event planners, audiences love her! Most people like to see it before they believe it so here’s a few short videos of Julie to help you make your mind up when it comes to booking your next speaker, program facilitator, off site program leader or exclusive expedition for your organization. Energy and relevant high content drives success, which is why Julie has been booked to speak around the globe to a diverse cross section of industry sectors and audience. Before you make up your mind on who to book take a minute to enjoy the video’s below and just imagine having Julie live at your next event or running an offsite development program or leadership expedition. Feel free to share these videos with your colleagues, clients and friends who are looking for a high impact speaker. 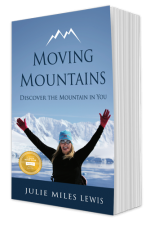 Moving Mountains Available on Amazon now!